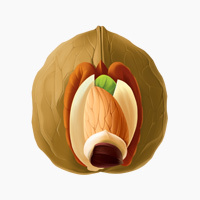 Are Nuts And Seeds Healthy? 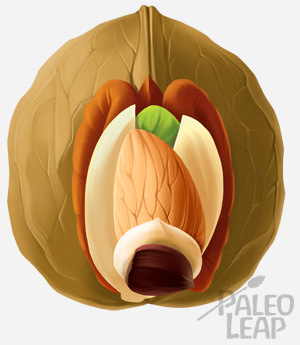 Nuts and seeds are a very popular snack among Paleo eaters and some people end up consuming quite a few of them. After all, they’re an easy and handy snack to bring to work or on hikes and most of them are loaded with nutrients. We know however that the fact that most nuts and seeds were available to our ancestors is not enough in itself to justify frequent consumption. We need to look further into the composition of nuts and seeds, their levels of toxins and their nutritive value and assess things from there. I already recommend cutting all nuts and seeds to people with digestive or autoimmune problems and people with gut flora imbalances, but what about healthy people? You’ll see here that the answer is a mixed bag (of nuts) and that not all nuts or seeds are created equal. You’ll also see why I recommend keeping most nuts to a minimum and as an occasional snack while keeping in mind that the nutritional value is often offset by undesired properties. There are also some steps that can be taken to reduce the toxic load of most nuts that should prove helpful to those who want to indulge. In the conclusion, I’ll recommend the best nuts to consume and those to eat only very sporadically. Grains and legumes are king when it comes to antinutrients, lectins, enzyme inhibitors and toxic proteins, but some nuts and seeds use similar defense mechanisms. Of course, unlike some very nasty plant proteins (e.g. gluten), long term damage and autoimmunity are unlikely to happen from eating nuts and seeds. Lectins in some nuts and seeds can irritate the gut lining and create inflammation and enzyme inhibitors can prevent the full digestion of the proteins in them. Phytic acid is a strategy employed to prevent the nut or seed from sprouting before the ideal conditions are present. Phytic acid in our digestive system has the ability to bind to minerals like calcium, iron and magnesium and prevent them from being absorbed. This also means that you won’t necessarily get high amounts of a mineral even if you eat a nut high in that mineral. Soaking your nuts and seeds overnight in salty water is an easy way to get rid of most of the phytic acid and other antinutrients. After the nuts have soaked for a number of hours, rinse them thoroughly and dry them under the sun, in a dehydrator or in an oven set at the absolute lowest temperature. You don’t absolutely need to dry the soaked nuts and seeds, but the moisture will make it easy for mold to grow, so they should be eaten quite quickly. The other problem when it comes to most nuts and seeds is the high amount of polyunsaturated fat (PUFA), especially the omega-6 polyunsaturated fat. Along with excess fructose and consumption of toxic grains and legumes, excess omega-6 and total PUFA intake strongly contribute to today’s chronic and metabolic diseases like diabetes, heart disease and obesity. In Paleo community, a huge focus is placed on balancing omega-6 and omega-3 intake to obtain a ratio as close to 1:1 as possible, but keeping the total intake of PUFA low is just as important, if not more. In high amount, any kind of PUFA, even omega-3s, become highly reactive and toxic. In an effort to optimize health and longevity, one should strive to keep a total PUFA intake under 4% of total calories and an omega-6/omega-3 ratio very close to 1:1. On an average 2,200 calorie diet, 4% PUFA means only about 5 to 8 grams of omega-6 per day to maintain the proper ratio with omega-3 fats. This is very low and most nuts and seeds will quickly raise the amount to unhealthy levels. Omega-3 fats should be obtained from fatty wild fish, grass-fed ruminants and omega-3 rich eggs. PUFAs are easily oxidized when in contact with oxygen, heat and light, and oxidized PUFAs are a very bad deal for our health because they create all kinds of toxic reactions with sugars and proteins in our bodies. For this reason, nuts and seeds are much better eaten unroasted and should be refrigerated in an air-tight container and eaten promptly. Nuts or seeds that contain appreciable levels of omega-3 fat are not necessarily a good source of omega-3 because the form of omega-3 found in plants, nuts and seeds is alpha-Linolenic acid (ALA), which isn’t useful for the body. When we talk about omega-3 fats being essential for the body, we’re talking about the long-chain EPAs and DHAs. ALA can be elongated to EPA and DHA, but the process is very inefficient. Almonds are moderately high in PUFA, with a total of 12.1 grams per 100 grams, most of it in omega-6. They are a good source of manganese, copper, magnesium, vitamin E and riboflavin. Wild almonds are highly toxic with a compound that breaks down to cyanide, but modern domesticated almonds don’t contain that compound. Macadamia nuts are low in total PUFA compared to other nuts, with a total of only 1.5 grams per 100 grams and most of their fat being monounsaturated. The amount of total PUFA is low enough that the omega-6/omega-3 ratio is not a concern. They are a good source of thiamine, copper and manganese. Macadamia nuts are also very low in antinutrients like phytic acid. They are healthy even in higher amounts. Pistachios are moderately high in PUFA, with a total of 13.2 grams per 100 grams, most of it in omega-6 fat. They are a good source of copper, thiamine, manganese and vitamin B6. Walnuts are very high in PUFA, with a total of 47.2 grams per 100 grams, with a fair amount omega-3 fat. They are often praised for their high omega-3 content, but are way too high in total PUFA and still have a bad omega-6 to omega-3 ratio. They are a good source of magnesium. manganese and copper. Pine nuts are very high in PUFA, with a total of 34.1 grams per 100 grams, most of it in omega-6 fat. They are a good source of manganese, copper and magnesium. Chestnuts are very low in total PUFA, 0.9 grams per 100 grams, low enough that the omega-6/omega-3 ratio doesn’t matter. They are also low in antinutrients like phytic acid. Chestnuts are considered a real nut and are starchy instead of fatty and this is why they are low in PUFA. 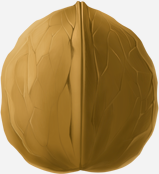 Unlike other nuts, they can be roasted at higher temperatures without problems. They are a good source of vitamin C, copper, manganese and vitamin B6. They are the only nut with an appreciable amount of vitamin C.
Pecans are high in PUFA, with a total of 21.6 grams per 100 grams, most of it in omega-6 fat. They are a good source of manganese, copper and thiamine. Hazelnuts, also known as filberts, are moderately low in PUFA, with a total of 7.9 grams per 100 grams, most of it in omega-6 fat. They are a good source of vitamin E, thiamin, copper and manganese. Brazil nuts are high in PUFA, with a total of 20.6 grams per 100 grams, most of it in omega-6 fat. They are an extremely good source of selenium, with 774% of the recommended daily allowance (RDA) per 6 nuts. Selenium is an extremely important nutrient that’s lacking in many people’s diet. It’s a crucial antioxidant and is very important for the well functioning of the thyroid gland. Selenium is so important that it could be wise to eat a few Brazil nuts regularly even though they are high in total PUFA. Keep in mind however that selenium becomes toxic in high amounts and that 2 or 3 Brazil nuts per day should be more than enough. They are also a good source of magnesium and copper. Cashews are moderately low in PUFA, with a total of 7.8 grams per 100 grams, most of it in omega-6 fat. They are a good source of magnesium, phosphorus, copper and manganese. Pumpkin seeds are high in PUFA, with a total of 20.9 grams per 100 grams, most of it in omega-6 fat. They are a very good source of magnesium, a mineral that’s lacking in most people’s diet. They are also a good source of copper, manganese, iron and phosphorus. Sunflower seeds are high in PUFA, with a total of 23.1 grams per 100 grams, most of it in omega-6 fat. They are a good source of vitamin E, thiamin, magnesium, copper, manganese and selenium. Sesame seeds are high in PUFA, with a total of 21.8 grams per 100 grams, most of it in omega-6 fat. They are a good source of calcium, iron, magnesium, copper and manganese. Flax seeds are high in PUFA, with a total of 28.7 grams per 100 grams, most of it in omega-3 fat, contrary to other nuts. Even though they are high in omega-3 fat, the omega-3 is in the ALA form (alpha-Linolenic acid), which is a short-chain form that needs to be elongated to EPA and DHA to be useful for the body. The body’s mechanisms to elongate ALA to EPA and DHA are very inefficient and ALA forms of omega-3 fats are not good sources of omega-3 for us. Unless you enjoy them, don’t go out of your way to eat them as they are not a great choice to get more omega-3 compared to fatty fish and grass-fed ruminant meat. They are a good source of thiamin and manganese. Peanuts are in reality a legume and should be avoided. 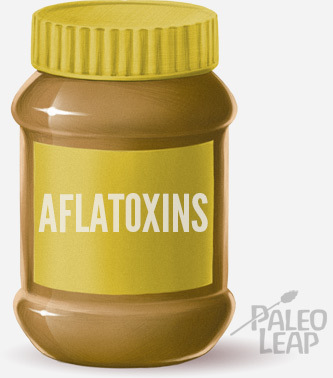 Other than a bad fatty acid profile, they are one of the most common food allergens, are loaded with antinutrients, are high in lectins and are a source of aflatoxin, a known carcinogen. Nuts like walnuts and pine nuts are some of the worst ones in terms of fatty acid profile. We also learned that we can make the nutrients in nuts and seeds more bioavailable and mitigate the antinutrient properties in them by soaking them in salty water overnight.